• This ruggedly constructed table will consistently support patient weights up to 350 pounds, making it ideal for busy clinics with demanding caseloads. Heavy-duty, all-steel construction and an extra-long pedestal create a durable table that will last for years. 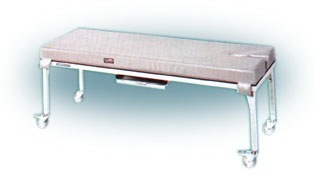 • Patient positioning is quick and easy on the flat top table. Its smooth surface means no grooves or ridges for clothes to snag or grime to collect. • An integrated design provides continuous attachment of the tubestand to the table and requires no modification of office walls or ceilings. • One feature enables a full range of off-table procedures including stand-knee and ankle. The complete system includes the Americomp Wallstand and your choice of high-performance generators. Every radiographic generator design starts with essentially the same objective: create x-rays efficiently and control their production. But how the design accomplishes this objective is what makes the difference. Americomp's approach to design is shown in the Spectra 325E. The styling is clean and functional. The control panel is ergonomically engineered both for comfort and ease of operation. 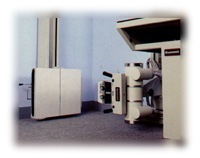 Features like SCR contactor, tube protection systems and a solid state digital timer contribute to your imaging quality and satisfaction. Throughout, a focused effort was made to provide safety for both patient and operator. The entire design philosophy is aimed at providing you a unique combination of safety, reliability, quality and value. 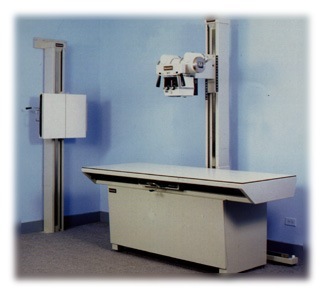 That is what sets the Spectra 325E apart when it comes to the challenging task of creating x-rays. • Maximum Output is 300 mA at 125 kVp. 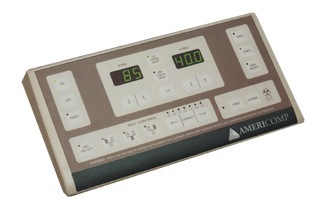 The power of a hospital grade unit in a compact form ideal for a clinic or private practice. • SCR Contactor with Back-Up Electromagnetic Safety Contactor opens and closes the tube power circuit at zero voltage, preventing tube damaging voltage spikes. • Tube overload protection circuits alert the user if any technique setting (kV, mA and time) exceeds the tube rating, and prevents an exposure. • Digital mAs reduces user reading error and improves setting accuracy and repeatability. • 5 mA Stations (50s, 100s, 150L, 200L, 300L), mA output is precisely controlled through automatic space charge compensation over the entire mA and kVp range. • Digital Timer with 23 Stations (1/120 to 6 seconds) 14 time stations below 1/2 second easily accommodate the use of rare earth intensifying screens. • Vinyl Wear-Resistant Control Panel face cleans easily. The operator console is remarkably easy to use. The operator simply enters the kVp and mAs technique factors. 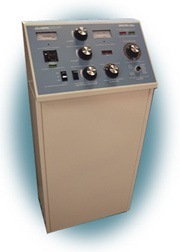 The SPECTRA 30HF generator automatically selects the highest mA and shortest exposure time possible. The dual mAs/ma digital display provides the operator with the opportunity to view the mA the SPECTRA 30HF selected. Giving the operator total control, the mA can be modified when longer exposure times are desired. The optional state-of-the-art Automatic Exposure Control (AEC) provides consistent film density, even when pathology is present. With up to three fields in the AEC chamber, the operator simply selects the field(s) under the anatomy of interest and enters the kVp. The SPECTRA 30HF will terminate the exposure at the exact mAs necessary to obtain a high quality film. After the exposure, the mAs value will be displayed for reference and documentation. The A-4000 is a heavy duty, 4-way float top elevating table designed especially for the hospital, clinic or private office. This ruggedly designed compact modular system allows for easy handling of heavy case loads even in the smallest of rooms. Patient transferring is made easy with the hand operated table function control which mounts conveniently to the accessory rail. The flat, unseamed table top glides easily on precision ball bearings making patient positioning effortless. Made in the U.S.A., Americomp's 4-way float top elevating table assures quality craftsmanship with quick delivery and easy access to replacement parts. • Variable Vertical Lift from 22 1/2"-34"
• Table weight 650 lbs. • Rated patient load of 400 lbs. Built of welded all steel construction, Americomp's A-3100 and A-3199 x-ray tables are sleek yet sturdy enough to handle heavier patient loads. And with the optional drop leaf feature, these tables will accommodate even the smallest of x-ray rooms. Made in the U.S.A., all of Americomp's competitively priced tables carry a five-year defective parts warranty. • Rated patient load of 300 lbs. 12" non-radiographic drop leaf. Specify right or left. Removable 4" high-density foam pad with facial slot. Par speed, 14" x 17" with 85 line, 8:1 grid. Replaces grid cabinet and grid. Available only with A-3100 Stationary Table.